GERMAN COLONISTS UNDER CATHERINE II. 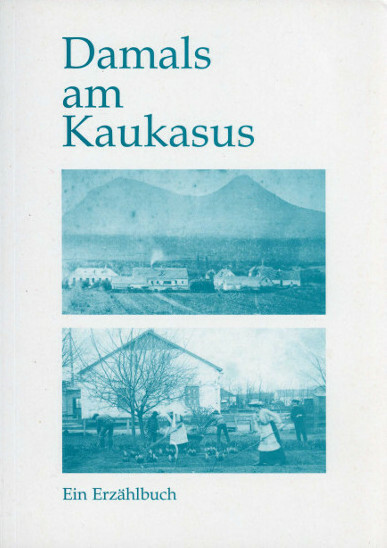 The following maps and photographs were scanned from a copy of the obscure Damals am Kaukasus: Ein Erzählbuch über Entstehung, Blütezeit und Untergang der deutschen Tempelsiedlungen im Nordkaukasus-Gebiet (Stuttgart: Gebietsleitung der Tempelgesellschaft in Deutschland, 2001)—an alas poorly-illustrated compilation of short histories, essays and memoirs written by 33 former colonists and their descendants, &c.
The first page of the Russian Empress Catherine II. 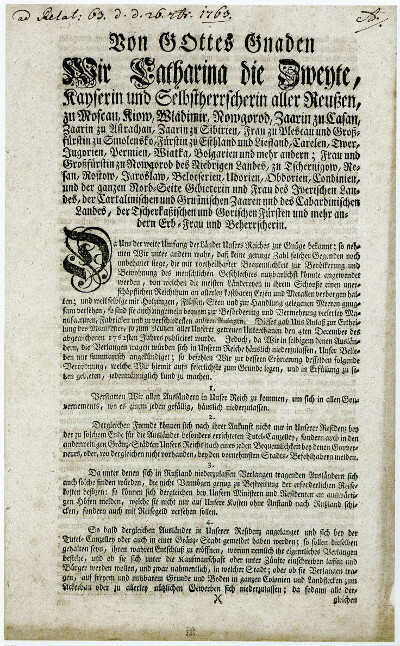 's second proclamation on colonization (25th of July 1763). 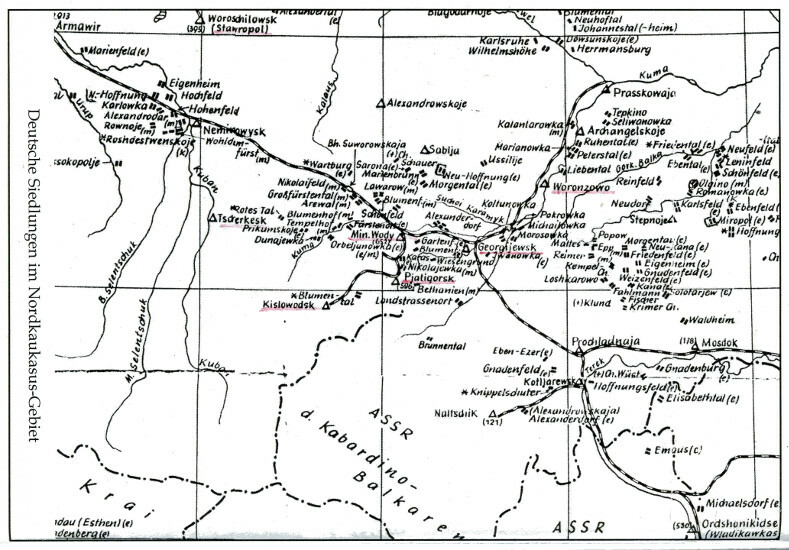 A map of German colonies along the banks of the River Volga drawn by Arnold Triper of Saratov (1777). 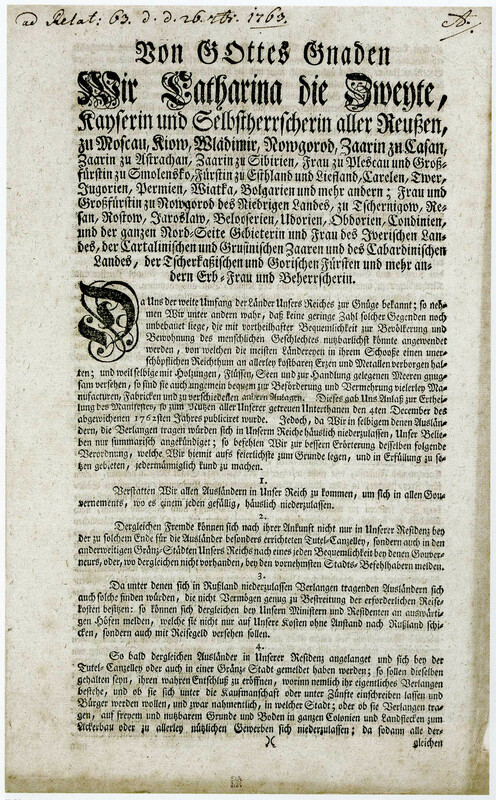 An edict issued by Frederick II., Duke of Württemberg, restricting emigration from his lands (9th of March 1804). We, Catharine the Second, Czarina and ruler of all the Russians, in Moscow, Kiev, Vladimir, Novgorod, Czarina of Casan, Czarina of Astrachan, Czarina of Siberia, Mistress of Pskov and Grand Duchess of Smolensk, Duchess of Estonia and Lithuania, Karelia, Tver, Yugoria, Perm, Viatka, Bolgar and others; Mistress and Grand Duchess of Novgorod of the Low Lands, of Chernikov, Resan, Rostov, Yaroslav, Belarus, Udoria, Obdoria, Condinia and Commander of the entire North Side and Mistress of the Iverian country, of the Cartalinian and Grusinian czars and of the Kabardinian land, of the Cherkassian and Goritsian dukes and Hereditary Mistress and Ruler of others. As We are sufficiently aware of the vast extent of the lands within Our Empire, We perceive, among other things, that a considerable number of regions are still uncultivated which could easily and advantageously be made available for productive use of population and settlement. 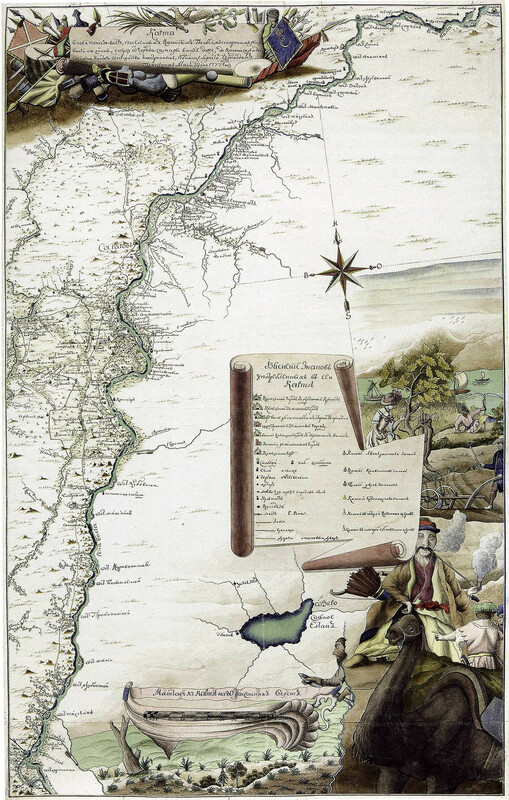 Most of the lands hold hidden in their depth an inexhaustible wealth of all kinds of precious ores and metals, and because they are well provided with forests, rivers and lakes, and located close to the sea for purpose of trade, they are also most convenient for the development and growth of many kinds of manufacturing, plants, and various installations. This induced Us to issue the manifesto which was published last Dec. 4, 1762, for the benefit of all Our loyal subjects. However, inasmuch as We made only a summary announcement of Our pleasure to the foreigners who would like to settle in Our Empire, we now issue for a better understanding of Our intention the following decree which We hereby solemnly establish and order to be carried out to the full. 1. We permit all foreigners to come into Our Empire, in order to settle in all the gouvernements, just as each one may desire. 2. After arrival, such foreigners can report for this purpose not only to the Guardianship Chancellery established for foreigners in Our residence, but also, if more convenient, to the governor or commanding officer in one of the border-towns of the Empire. 3. Since those foreigners who would like to settle in Russia will also include some who do not have sufficient means to pay the required travel costs, they can report to our ministers in foreign courts, who will not only transport them to Russia at Our expense, but also provide them with travel money. 4. Sobald dergleichen Ausländer in Unserer Residenz angelangt und sich bei der Tütel-Canzley oder in einer Gränz-Stadt gemeldet haben werden; so sollen dieselben gehalten sein, ihren wahren Entschluß zu eröffner, worinn nehmlich ihr eigentliches Verlangen bestehe, und ob sie sich unten die Kaufmannscgaft oder unter Zünfte einschreiben lassen und Bürger werden wollen, und zwar nahmentlich, in welcher Stadt; oder ob sie Verlangen tragen, auf freyem und nuntzbarem Grunde und Boden in ganzen Kolonien und Landflecken zum Ackerbau oder zu allerley nützlichen Gewerben sich niederlassen; da sodann alle dergleichen Leute nach ihrem eigenen Wunsche und Verlangen ihre Bestimmung unverweilt erhalten; gleich denn aus beifolgendem Register zu ersehen ist, wo und an welchen Gedenden Unseres Reiches nahmentlich freye und zur häuslichen Niederlassung bequeme Ländereyen vorhanden sind; wiewohl sich außer der in bemeldetem Register aufgegebenen noch ungleich mehrere weitläufige Gegenden und allerley Ländereyen finden, allwo Wir gleichergestalt verstatten sich häuslich niederzulassen, wo es sich ein jeder am Nützlichsten selbst wählen wird. 4. As soon as these foreigners arrive in Our residence and report at the Guardianship Chancellery or in a border-town, they shall be required to state their true decision whether their real desire is to be enrolled in the guild of merchants or artisans, and become citizens, and in what city; or if they wish to settle on free, productive land in colonies and rural areas, to take up agriculture or some other useful occupation. Without delay, these people will be assigned to their destination, according to their own wishes and desires. From the following register it can be seen in which regions of Our Empire free and suitable lands are still available. However, besides those listed, there are many more regions and all kinds of land where We will likewise permit people to settle, just as each one chooses for his best advantage. 5. 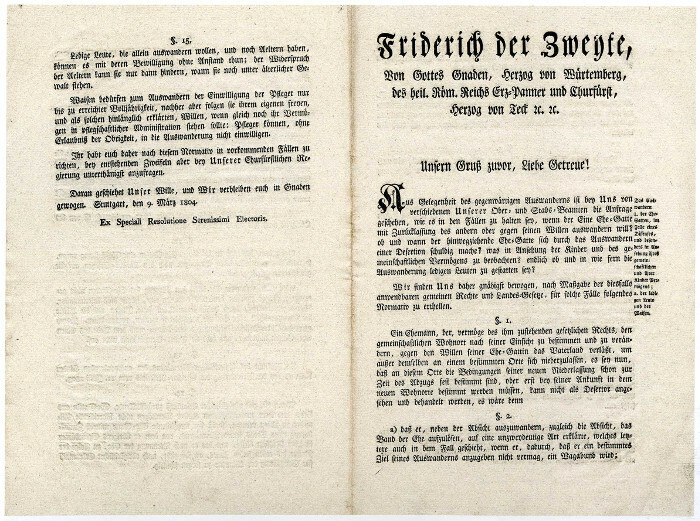 Upon arrival in Our Empire, each foreigner who intends to become a settler and has reported to the Guardianship Chancellery or in other border-towns of Our Empire and, as already prescribed in # 4, has declared his decision, must take the oath of allegiance in accordance with his religious rite. — 1. Gestatten Wir allen in Unser Reich ankommenden Ausländern unverhindert die freie Religions-Übung nach ihren Kirchen-Satzungen und Gebräuchen; denen aber, welche nicht in Städten, Sondern auf unbewohnten Ländereyen sich besonders in Colonien oder Landflecken nieder zu lassen gesonnen sind, erteilen Wir die Freyheit Kirchen und Glocken-Thürme zu bauen und die dabey nöthige Anzahl Priester und Kirchendiener zu unterhalten, nur einzig den Klosterbau ausgenommen. Jedoch wird hierbey jedermann gewarnt keinen in Rußland wohnaften christlichen Glaubensgenossen, unter gar keinem Vorwande zur Annehmung oder Beypflichtung seines Glaubens und seiner Gemeinde zu bereden oder zu verleiten, falls er sich nicht der Furcht der Strafe nach aller Strenge Unserer Gesetze auszusetzen gesonnen ist. Hievon sind allerley an Unserm Reiche angrenzende dem Mahometanischen Glauben zugethane Nationen ausgeschlossen; als welche Wir nicht nur auf eine anständige Art zur christlichen Religion zuneigen, sondern auch sich selbige unterhänig zu machen, einem jeden erlauben und gestatten. — 1. We grant to all foreigners coming into Our Empire the free and unrestricted practice of their religion according to the precepts and usage of their Church. To those, however, who intend to settle not in cities but in colonies and villages on uninhabited lands we grant the freedom to build churches and belltowers, and to maintain the necessary number of priests and church servants, but not the construction of monasteries. On the other hand, everyone is hereby warned not to persuade or induce any of the Christian co-religionists living in Russia to accept or even assent to his faith or join his religious community, under pain of incurring the severest punishment of Our law. This prohibition does not apply to the various nationalities on the borders of Our Empire who are attached to the Mahometan faith. We permit and allow everyone to win them over and make them subject to the Christian religion in a decent way. — 2. Soll keiner unter solchen zur häuslichen Niederlassung nach Rußland gekommen Ausländern an unsere Cassa die geringsten Abgaben zu entrichten, und weder gewöhnliche oder außerordentliche Dienste zu leisten gezwungen, noch Einquartierung zu tragen verbunden, sondern mit einem Worte, es soll ein jeder von aller Steuer und Auflagen folgendermaßen frey sein: diejenigen nehmlich, welche in vielen Familien und ganzen Colonien eine bisher noch unbekannte Gegend besetzen, genießen dreyßig Frey-Jahre; die sich aber in Städten niederlassen und sich entweder in Zünften oder unter der Kaufmannschaft einschreiben wollen, auf ihre Rechnung in Unserer Residenz Sankt-Petersburg oder in benachbarten Städten in Lifland, Estland, Ingermanland, Carelien und Finland, wie nicht weniger in der Residenz-Stadt Moscau nehmen, haben fünf Frey-Jahre zu genißen. Wonechst ein jeder, der nicht nur auf einige kurze Zeit, sondern zur würklichen häuslichen Niederlassung, nach Rußland kommt, noch überdem ein halbes Jahr hindurch frey Quartiert haben soll. — 2. 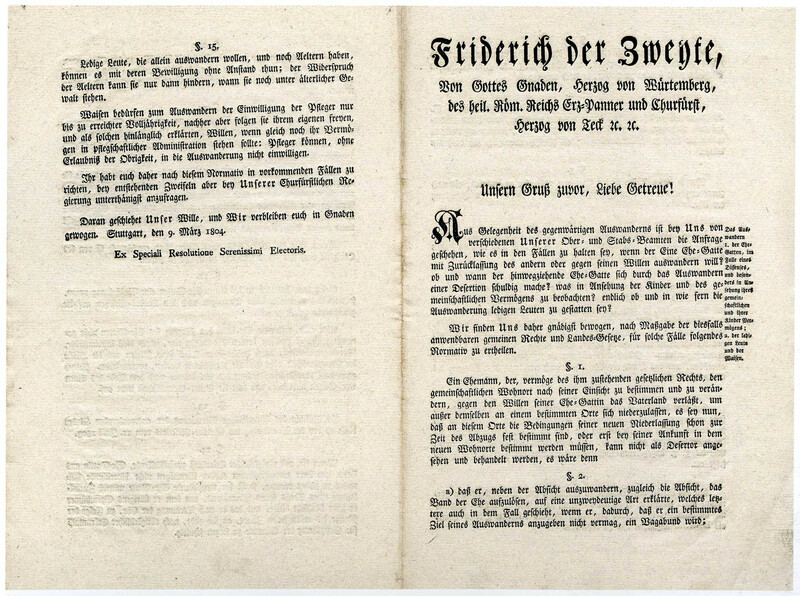 None of the foreigners who have come to settle in Russia shall be required to pay the slightest taxes to Our treasury, nor be forced to render regular or extraordinary services, nor to billet troops. Indeed, everybody shall be exempt from all taxes and tribute in the following manner: those who have been settled as colonists with their families in hitherto uninhabited regions will enjoy 30 years of exemption; those who have established themselves, at their own expense, in cities as merchants and tradesmen in Our Residence St. Petersburg or in the neighboring cities of Livland, Esthonia, Ingermanland, Carelia and Finland, as well as in the Residential city of Moscow, shall enjoy 5 years of tax-exemption. 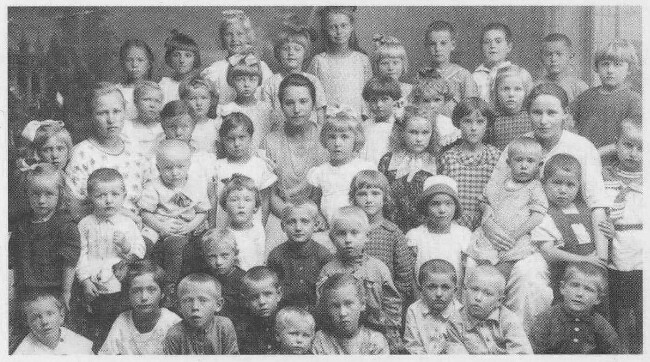 Moreover, each one who comes to Russia, not just for a short while but to establish permanent domicile, shall be granted free living quarters for half a year. — 3. Allen zur häuslichen Niederlassung nach Rußland gekommenen Ausländern, die entweder zum Kornbau und anderer Hand-Arbeit, oder aber Manufacturen, Fabriken und Anlagen zu errichten geneigt sind, wird alle hülfliche Hand und Vorsorge dargeboten und nicht allein hinlanglich und nach eines jeden, erforderlichen Vorschub gereichet werden, je nachdem es die Notwendigkeit und der künftige Nutzen von solcher zu errichtenden Fabriken und Anlagen erheischet, besonders aber von solchen, die bis jetzo in Rußland noch nicht errichtet gewesen. — 3. 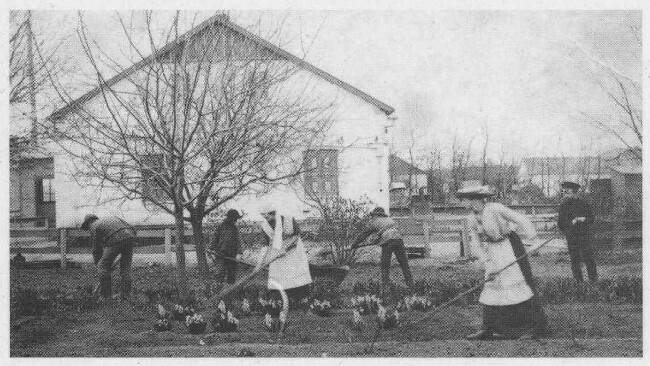 All foreigners who settle in Russia either to engage in agriculture and some trade, or to undertake to build factories and plants will be offered a helping hand and the necessary loans required for the construction of factories useful for the future, especially of such as have not yet been built in Russia. — 4. Zum Häuser-Bau, zu Anschaffung verschiedener Gattung im Hauswesen benöthigten Viehes, und zu allerley wie beym Ackerbau, also auch bey Handwerken, erforderlichen Instrumenten, Zubehör und Materialien, soll einem jeden aus Unserer Cassa das nöthige Geld ohne alle Zinsen vorgeschossen, sondern lediglich das Kapital, und zwar nicht eher als nach Verfießung von Jahren, in drey Jahren zu gleichen Theilen gerechnet, zurück gezahlt werden. — 4. 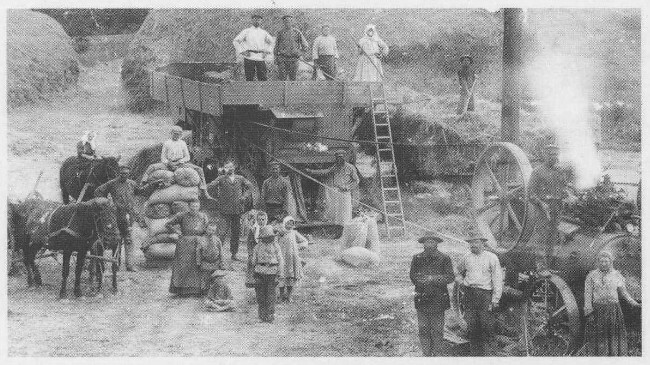 For the building of dwellings, the purchase of livestock needed for the farmstead, the necessary equipment, materials, and tools for agriculture and industry, each settler will receive the necessary money from Our treasury in the form of an advance loan without any interest. The capital sum has to be repaid only after ten years, in equal annual instalments in the following three years. — 5. Wir überlassen denen sich etabirten ganzen Colonien oder Landflecken die innere Verfassung der Jurisdiction ihrem eigenen Gutdünken, solchergestalt, daß die von Uns verordenten obrigkeitlichen Personen an ihren Einrichtungen gar keinen Antheil nehmen werden, im übrigen aber sind solche Coloniesten verpflichtet sich Unserem Civil-Rechte zu unterwerfen. Falls sie aber selbst Verlangen trügen eine besondere Person zi ihrem Vormunde oder Besorger ihrer Sicherheit und Verteidigung von uns zu erhalten bis sie sich mit den benschbarten Einwohnern dereinst bekannt machen, der mit einer Salvegarde von Soldaten, die gute Mannszucht halten, versehen sey, so soll Ihren auch hierinnen gewillfahren werden. — 5. We leave to the discretion of the established colonies and village the internal constitution and jurisdiction, in such a way that the persons placed in authority by Us will not interefere with the internal affairs and institutions. In other respects the colonists will be liable to Our civil laws. However, in the event that the people would wish to have a special guardian or even an officer with a detachment of disciplined soldiers for the sake of security and defense, this wish would also be granted. — 6. Einem jeden Ausländer, der sich in Rußland häuslich niederlassen will gestatten Wir die völlige zollfreye Einfuhr seines Vermögens, es bestehe dasselbe worinn es wolle, jedoch mit dem Vorbehalte, daß solches Vermögen in seinem eigenen Gebrauche und Bedürfnis, nicht aber zum Verkaufe bestimmt sey. Wer aber außer seiner eigenen Nothdurft noch einige Waaren zum Verkauf mitbrächte, dem gestatten Wir freyen Zoll für jede Familie vor drey Hundert Reubel am Werte der Waaren, nur in solchem Falle, wenn sie wenigstens zehen Jahre in Rußland bleibt: widrigenfalls wird bey ihrer Zurück-Reise der Zoll sowol für die eingekommene als ausgehende Waaren abgefordet werden. — 6. To every foreigner who wants to settle in Russia We grant complete duty-free import of his property, no matter what it is, provided, however, that such property is for personal use and need, and not intended for sale. However, any family that also brings in unneeded goods for sale will be granted free import on goods valued up to 300 rubles, provided that the family remains in Russia for at least 10 years. Failing which, it be required, upon its departure, to pay the duty both on the incoming and outgoing goods. — 7. Solche in Rußland sich niederlassene Ausländer sollen während der ganzen Zeit ihres Hierseins, außer dem gewöhnlichen Land_Dienste, wider Willen weder in Militär noch Civil-Dienst genommen werden; ja auch zur Leistung dieses Land-Dienstes soll keines eher als nach Verfließung obangesetzter Freyjahre verbunden seyen: wer aber freywillig geneigt ist, unter die Soldaten in Militär-Dienst zu treten, dem wird man außer dem gewöhnlichen Solde bey seiner Envollirung beyem Regiment Dreißig Rubel Douceur-Geld reichen. — 7. The foreigners who have settled in Russia shall not be drafted against their will into the military or the civil service during their entire stay here. Only after the lapse of the years of tax-exemption can they be required to provide labor service for the country. Whoever wishes to enter military service will receive, besides his regular pay, a gratuity of 30 rubles at the time he enrolls in the regiment. — 8. Sobald sich Ausländer in der für sie errichteten Tütel-Canzley oder sonst in Unsern Gränz-Städten gemeldet und ihren Entschluß eröffnet haben, in das innerste das Reiches zu reisen, und sich daselbst häuslich niederzulassen, so bald werden selbige auch Kostgeld, nebst freyer Schieße an den Ort ihrer Bestimmung bekommen. — 8. As soon as the foreigners have reported to the Guardianship Chancellery or to our border towns and declared their decision to travel to the interior of the Empire and establish domicile there, they will forthwith receive food rations and free transportation to their destination. — 9. Wer von solchen in Rußland sich etablirten Ausländern dergleichen Fabriken, Manufacturen oder Anlagen errichtet, und Waaren daselbst verfertigt, welche bis dato in Rußland noch nicht gewesen, dem gestatten Wir, dieselben Zehen Jahre hindurch, ohne Erlegung irgend einigen inländischen See- oder Rränze - Zolles frey zu verkaufen, und aus Unserem Reiche zu verschicken. — 9. Those among the foreigners in Russia who establish factories, plants, or firms, and produce goods never before manufactured in Russia, will be permitted to sell and export freely for ten years, without paying export duty or excise tax. — 10. Ausländische Capitalisten, welche aufihre eigenen Kosten in Rußland Fabriken, Manufacturen und Anlagen errichten, erlauben Wir hiemit zu solchen ihren Manufacturen, Fabriken und Anlagen erforderliche leibeigene Leute und Bauern zu erkaufen. Wir gestatten auch. — 10. 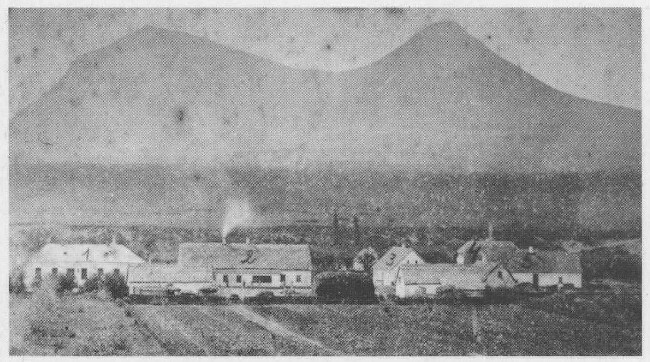 Foreign capitalists who build factories, plants, and concerns in Russia at their own expense are permitted to purchase serfs and peasants needed for the operation of the factories. — 11. Allen in Unserm Reiche sich in Colonien oder landflecken niedergelassenen Ausländern, nach ihrem eigenen Gutdünken Markt-Tage und Jahrmärkte anzustellen, ohne an Unsere Cassa die geringsten Abgaben oder Zoll zu erlegen. — 11. We also permit all foreigners who have settled in colonies or villages to establish market days and annual market fairs as they see fit, without having to pay any dues or taxes to Our treasury. 7. 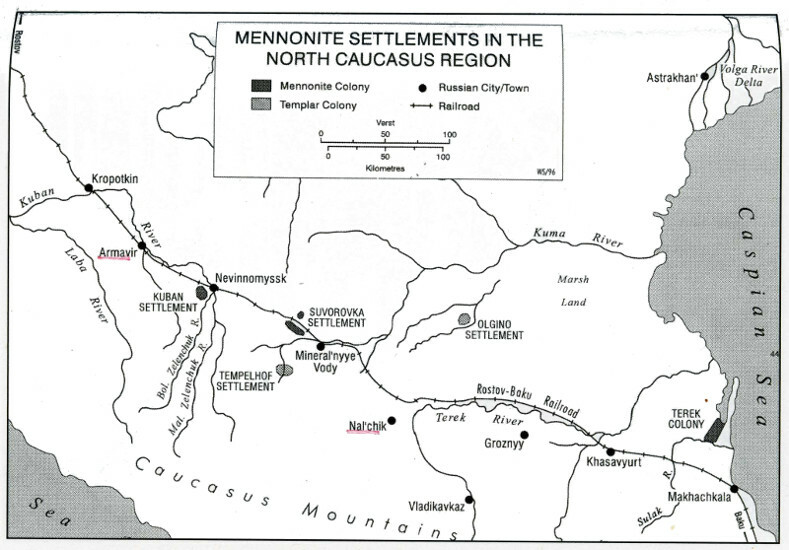 All the afore-mentioned privileges shall be enjoyed not only by those who have come into our country to settle there, but also their children and descendants, even though these are born in Russia, with the provision that their years of exemption will be reckoned from the day their forebears arrived in Russia. 8. After the lapse of the stipulated years of exemption, all the foreigners who have settled in Russia are required to pay the ordinary moderate contributions and, like our other subjects, provide labor- service for their country. 9. Finally, in the event that any foreigner who has settled in Our Empire and has become subject to Our authority should desire to leave the country, We shall grant him the liberty to do so, provided, however, that he is obligated to remit to Our treasury a portion of the assets he has gained in this country; that is, those who have been here from one to five years will pay one-fifth, whole those who have been here for five or more years will pay one-tenth. Thereafter each one wil be permitted to depart unhindered anywhere he pleases to go. 10. If any foreigner desiring to settle in Russia wishes for certain reasons to secure other privileges or condlitions besides those already stated, he can apply in writing or in person to our Guardianship Chancellery, which will report the petition to Us. After examining the circumstances, We shall not hesitate to resolve the matter in such a way that the petitioner's confidence in Our love of justice will not be disappointed.